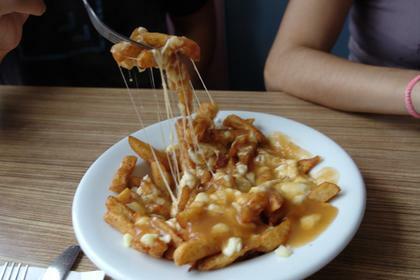 During my stay in Montreal this past July I wanted to make a point of visiting some new poutine places in my ever ongoing search for the Best Poutine in Montreal, something I started the year prior. This years search almost didn’t happen due to me getting sick. I wouldn’t let my little gastrointestinal problems stop me, as the day before I flew off to Germany (and the first day I started feeling good) I went out on an excursion to find the best poutine in Montreal. Now I must first preface this and say I had a warm-up poutine my first weekend in Quebec on route to a chalet in small town Quebec, and a second warm-up poutine at a fancy restaurant in Montreal. 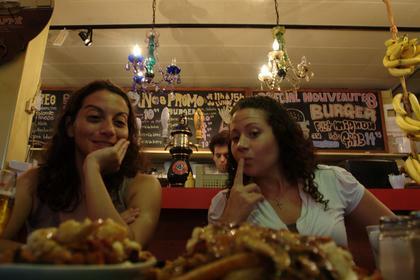 All the other poutines were ingested on the Sunday, with my tasting crew of Jason, Tatiana and Vanessa. Alright enough jibber jabber, onto the results! 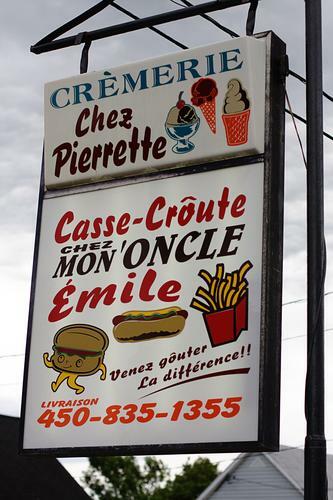 Located on the side of the road in the small town of Saint-Gabriel, this little take away restaurant provided me with my first poutine of the year. I had high expectations as my Brother and his Wife both told me the best poutine in Quebec was to be found in places little take aways like this. End result? The poutine was average. Yes my Nephew and his friend scarfed theirs down in probably 30 seconds or less, but that is likely more attributed to their hunger than the taste of the poutine. So why so average despite the initial good impressions? It was just kind of bland. The gravy wasn’t overly tasty, the cheese curds were not that stringy, and the fries, were nothing special. Don’t get me wrong, the poutine was still good, just nothing amazing. Jason, Tatiana and myself went out for some fine dining in Montreal at the Au Pied de Cochon. It is a happening French restaurant in a cool part of town. We enjoyed a really wonderful meal here, and the fact they had poutine on their menu, made things that much better. So the poutine they served is a Foie Gras Poutine. At $23 a plate, we decided it was best to share. This was ultimately a good idea as the poutine was quiet large. So what was in the poutine? 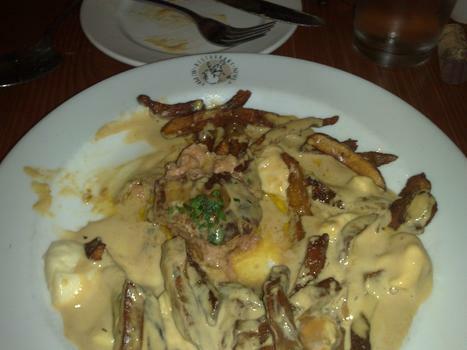 Basically it was a standard poutine, with a large chunk of Foie Gras placed on top. The gravy used was in the poutine was not typical however. It was more a creamy gravy that was extremely rich in flavor, a bit of a change from your typical beef/vegi stock gravy. I do have to say I thoroughly enjoyed the gravy of this poutine. The cheese curds were of high quality, and overall this was one delicious poutine. My only grips about the poutine was that the taste of the Foie Gras became a little overwhelming, but that could simply be because I don’t normally eat Foie Gras. Overall this poutine stands near the top of my list! This diner I had wanted to try out the year prior however didn’t get around to it. 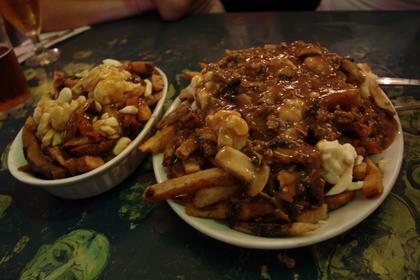 It is often listed as one of the top places to get poutine in Montreal. 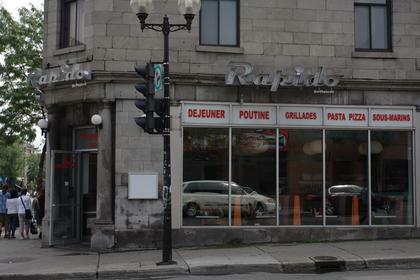 One of the big draws for Rapido is that it is open 24/7, so it often turns into the big drunken hangout after for people coming out of the bars looking for a poutine to fill their stomachs with. Jason, Tatiana and myself tried the standard poutine at Rapidos, and it was another case of looking good, but tasting nothing special. The gravy had a bit of a peculiar taste too it, somewhat of a poultry flavor, and had the consistency of one too (think chicken or turkey gravy). The cheese was extremely melty/stringy, however Tatiana was very concerned that it was not even cheese curds, but rather mozzarella. The taste of the cheese strongly pointed towards this. So overall this poutine was average. I would likely get a poutine at Frite Alore before hitting up Rapido, but in a pinch their poutine will do. 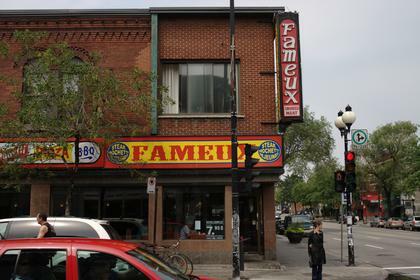 Famuex is located right across the street from Rapido, and apparently there is a lot of debate who has the better poutine. In a video podcast from CBC Radio 3, Murray Lightburn, lead singer of the Dears claimed Fameux had the best poutine in Montreal. He swore by their poutine gratinée. 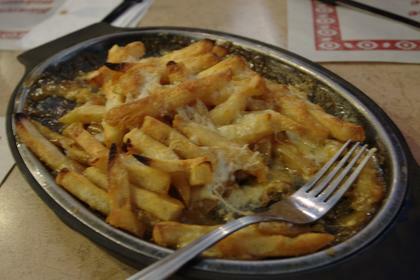 Basically gratinée means they put the poutine in the oven, so the cheese is very melted. We had high hopes, thinking the poutine gratinée would be a poutine lasagna of sorts. We were joined by Vanessa at Famuex, and our high hopes for the gratinée ended in disappointment. We found the poutine gratinée to be a bit dry, had an odd tasting gravy (similar tasting to Rapido oddly enough), and not really making us feel like we were eating a poutine. Perhaps if they had used more gravy in the poutine it would have tasted better, but from what we got, I can’t say I can recommend this poutine. So Murray Lightburn, while you can write one hell of a song, you sure could use a lesson in good poutines. Yes what would a poutine tasting tour of Montreal be without a stop at last years favorite Maamm Bolduc. This was our final stop on the tour as Jason had to get back to work (as poutine chef at Montreal Poutine!). So we marched our way in the pouring rain to Maamm Bolduc. We arrived to find it extremely busy. It took us a little while to get a table, and likewise to actually get served. Finally the waitress realized she totally forgot about us and got to our order. We order the same meat in wine sauce poutine as I had last time, as well as 1 small regular poutine for Vanessa as she is a vegetarian. Need I tell you what the overall consensus was from everyone? Best poutine they had ever had, and best in Montreal. I fully agree. The beef wine sauce is of course the favorite. It’s gravy is rich, but not over the top. The meat is tender, and adds to the overall flavor of the poutine. The fries are perfectly cook, clean (a sign that they change their oil), and fresh cut. The cheese curds were of good high quality, and very stringy. What more could you ask for? Maamm Bolduc is my top choice once again. A few places I really had high hopes for this year, turned out to be average or disappointments. Au Pied de Cochon did provide for a solid challenger for best poutine, however at $23 a plate, and the clashing taste from the Foie Gras, I had to stick with Maamm Bolduc. That is the beauty of the beef wine sauce poutine from Maamm Bolduc. The beef and wine gravy don’t clash with the flavor you expect from a poutine, but rather enhance it. Maybe someday I will find a better poutine, but for now, my Montreal favorite still remains Maamm Bolduc. I thoroughly enjoyed this poutine review. As i’ve never been there i felt a bit in the dark, maybe one day we can do a ‘best poutine in Vancouver’ day, i know it won’t live up to this but it would be enjoyeable none the less. The only gripe i have with this poutine tasting is that they should all be regular style to make it consistant. Yes I do agree Mike, we probably should have stuck just to the standard poutine, however it was too tempting to try all the specialties. I was thinking of doing the “best hotdog in Vancouver”, with Japadog, Mexidog, and all those stands that claim to be the best. Could be fun! Take it from a frenchy: A poutine with more than cheese, fries and gravy is NOT a poutine!!! They have a name for each of them, so I guess your whole experience is out the window.. Time for another flight to Montreal. While you’re there, you should try the very best poutine in the whole province!!! Chez Ashton. Montreal doesn’t have that chain, you’ll have to go all the way to Quebec City. But it’s totally worth the 3 hours drive! Ashton is actually the guy who invented poutine.. How can he be wrong? I would be also down for a best poutine in Vancouver. I’ve heard of a few good places, never really looked into it as last time I had one (on Commercial and 2nd), it was just aweful! I’ve had better poutine at KFC! OK Frank I will take that in consideration. When I get back from my next little trip here I will setup a day of poutine in Vancouver. There are a few good spots. Actually one of my favorite poutines is at Hells Kitchen on 4th. Umm umm. That place on commercial that advertises the “Best Poutine in Vancouver” then in small print “1998”, is horrible. I went there with some friends with high expectations, and was very disappointed.